When Adobe changed the name of Flash to Animate CC, many new features were added. You can read about them here but I’m just going to highlight two of my favorite new and not-so-new tools. Click on the Paint Brush Tool. Choose a stroke color and size from the Properties panel. In the Style section, click Brush Library to open a panel with a selection of paint brush styles. Explore the categories. I really liked Artistic, Decorative, and Pattern Brushes. Double click on a paint brush to add it to the Properties panel. Pick a stroke color and size. TIP: Increase the stroke height to see the paint brush effect clearly. Click and drag on the stage to draw with the paint brush. Rest the mouse pointer over the shape to move, bend, or reshape it. Use the Free Transform Tool to resize, rotate, or skew the shape. Use the Rectangle, Oval, or Brush Tools to draw a simple shape man. Turn Object Drawing Off. TIP: Do not use the Pencil Tool. Bones can only be added to objects that have a fill and no stroke. Click the Bone Tool. Position the mouse pointer at the base of the spine. The pointer changes to a bone. Click at the base of the spine to set the root bone. Click and drag upwards. Release the mouse button once the mouse pointer reaches the chest bone. Position the mouse pointer at the chest bone joint. Click and drag across. Release the mouse button, once the mouse pointer reaches the shoulder. Continue to draw bones to give the shape man a realistic skeleton. It’s fun to move the shape man. You can make each branch or limb move by clicking and dragging a bone. The joint pivots to create realistic movement as the bone is dragged. Click and drag the thigh bone or upper arm bone. To create an animated sequence, you need to add poses to the Timeline. To start you will set the beginning pose of the shape man in Frame 1. In Frame 50 you will add a keyframe. This becomes the end pose of the shape man. You will then gradually move the bones of the shape man to change the poses. Each change in pose will be added to the Timeline to make it look like the shape man is dancing. Click and drag the bones until the shape man is in the desired start pose. Look at the Timeline. Notice that there is a layer above Shape Man. It is an Armature layer. The poses go on this layer. Right click inside Frame 50 of the Armature layer. Select Insert Pose. Select Frame 5 in the Armature layer. Click and drag the arms and legs to change the pose. Move the playhead back and forth along the Timeline to see the shape man move. Select Frame 10 in the Armature layer. Click and drag the arms and legs slightly to change the pose again. Another keyframe is automatically added. 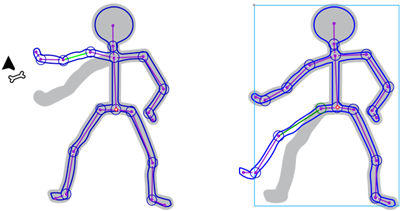 Continue to select Frames in the Timeline and alter the poses of the shape man. Drag the playhead or press ENTER to watch the animation. Learn about the Bone Tool, Paint Brush Tool, and more as you create an animated space story about a travelling alien in TechnoAnimate. Read all about this technology project, view an excerpt from the teacher guide, and see a skill summary here. TechnoKids has updated TechnoAnimate for the LATEST version of Animate CC (version 2018).